Are you an avid avoider of the library? If you’re a Charlotte Mason mom, bringing your child to the library is kind of like letting them have free reign in a candy store. At first glance, everything looks so colorful, so delicious. But then a closer look will tell you that it’s all junk. Your child will most definitely leave with their fair share of junk. I’ve written a lot about how to choose living books, (you can even download a free PDF here!) but this post focuses on WHY living books are important. Twaddle is junk food for the mind! Merriam-Webster defines the word twaddle as “a. Silly idle talk. b. Something insignificant or worthless.” When Charlotte Mason refers to twaddle in books, she means books that talk down to children, are poorly written, and lack any literary quality. Charlotte Mason says that children should never see twaddle, but they must have funny books. So, just because a book is silly doesn’t mean that it is not worthy of reading! When given the choice, a child might choose to eat candy at every meal of the day! But that doesn’t mean it’s good for him. In the same way, a child might enjoy twaddle, but it doesn’t nourish his mind. Living books introduce children to ideas that in turn shape their mental faculties and inspire them to grow in character and maturity. When children get into the habit of reading funny books or twaddle, they have a harder time enjoying books that are really worth their time. I want to make sure my children are reading living books early on. If I suddenly try to move away from “twaddle when they’re ten, it will be harder to convince them that it’s worthy. Junk food makes us crave more junk food. It is so difficult to cut out unhealthy foods if we eat them regularly because our bodies crave them. In the same way, allowing children to read twaddle will make them want to read only twaddle. You might know that I’m not completely sold on the idea that developing taste is an important part of education. In the Victorian Age, taste was a sort of morality. It was important to like the “right” things. In this case, I see why the ability to appreciate writers of beautiful words and wisdom is important. I know I’ve mentioned this before, but I think it’s worth repeating: living books and twaddle will be a matter of opinion. I recently heard a mom say that a certain book was most definitely twaddle. She said that this was not an opinion, this was a fact. 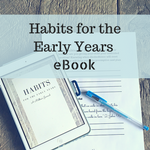 This same book in question came recommended as a great living book for the early years from a very reputable Charlotte Mason website! Just like we make the best possible choices for our family’s nutrition, choosing the best books for our children is entirely up to us! The Little Engine That Could is one of our favorite books, as well! I love that you are using those ideas to inspire your son! This is very interesting. What are some examples of Living Texts? Great question! This is up to the discretion of the parent- but classics are often living texts. My three-year old enjoys books by Robert McCloskey, The Snowy Day by Ezra Jack Keats, Madeline, etc. There are definitely modern living texts, too! I’ve seen some book lists include Guess How Much I Love You by Sam McBratney. For older children, the Little House on the Prairie books, The Boxcar Children, and Charlotte’s Web are classic living texts. I’m working on some book lists that I’ll share soon!